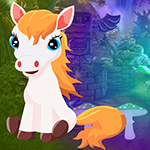 G4K White Horse Escape is another point & click escape game developed by Games4King. There was a magnificent palace in a beautiful forest where a white horse lived. That pretty pony was very clever. But alas: one day, the white horse got stuck in a room there anyway! Your duty is to rescue the mount. It will help you to find the hidden clues in the form of colours and numbers and to locate the items in the environment to save the animal. Find them all and solve all puzzles to free the white horse. Good luck and have fun! And I just thought there'd be a bug in the scene with the caged horse as I missed the back button for a whole time - bottom left corner of screen in the water. as per our current Comment Posting Rules (will be updated), we d/allow that you shout at our fellow players! Swans are already in position 1. Something quite unusual in G4K games. Sorry, not the swans but the mushrooms. You'll receive a swan. Found the place for the crocuses by chance, slots are basically invisible. So here a plain spoiler: on the ground to both sides of the caged horse. And that was close to the end. Nice and decent game, not hard if you play G4K regularly - if not: check everything very carefully and mind that solving a puzzle or putting in items sometimes not only gives some stuff but also may reveal some clues in the background. Thanks for another good game, G4K. Though I agree with meritneith; had to watch VWT to find spot for purple crocuses. Jef: there are always two ways to interpret those types of clues. Instead of numbering the objects 1-6, number them as the clue shows (261534). Then, press the correct order of 1-6. Thanks for the crocus hint - it was impossible to see! Also thanks for the brickpack hint! Gave it just average because of the 261534 error. Please check your games before posting. Mushrooms were not already set when I played and the 261534 number was correct. I guess they fixed some things! Thanks, G4K! (number clue was press third on first, then first one, then fifth, sixth, fourth, and then second.